Jackson, MI lays historic ties to The Salvation Army's notorious founder, William Booth stretching as far back as 1886 when William Booth delivered his first public address on U.S. soil. 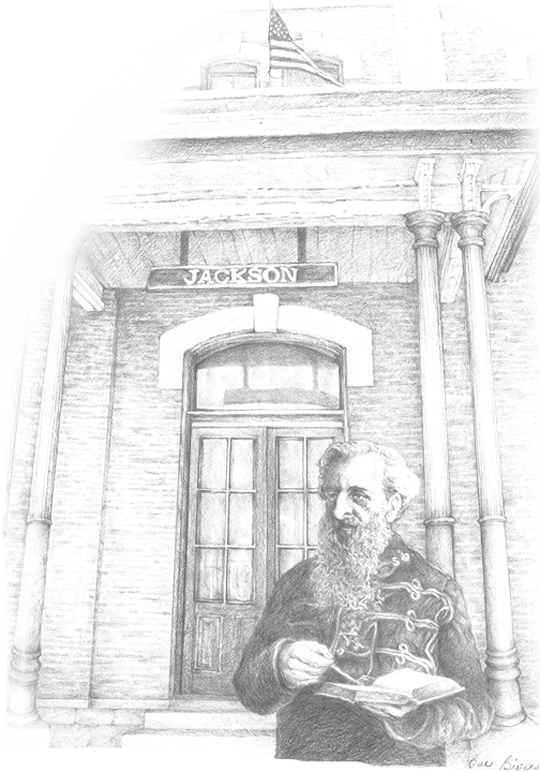 On September 26, 1886 during his inaugural trip to Canada and The United States William Booth pulled into Jackson's downtown train depot and addressed a large crowd who were eager to hear Booth's message. 133 years later, the legacy and vision of William Booth lives on in Jackson County through the many who have faithfully served and supported the mission and work of The Salvation Army. Booth laid the foundation in his address to continue the good fight to serve the poor, defeat social injustices and always show everyone, no matter what, the love of God. Today, is no different. The Salvation Army still remains committed to helping meet the growing needs of our community through a variety of programs, services and ministries for all. In 2018 a new donor organization was formed at The Salvation Army of Jackson County to commemorate Booth's heritage and The Salvation Army's long-standing ministry in Jackson. The 1885 Society, a prestigious donor organization, recognizes philanthropists who help ensure the mission continues in perpetuity for generations to come. Individuals, companies and foundations distinguish themselves as candidates for membership by making a monetary multi-year pledge donation of at least $1,000 or more for 3 years or commit outright to a minimum $3,000 gift. "The 1885 Society was formed to honor The Salvation Army's historic roots while honoring philanthropists who are invested in its ministry" says Shannon Skarritt, the Development Director for The Salvation Army of Jackson County. 1885 was when the good work of The Salvation Army was established in Jackson, MI and forming the 1885 Society will help keep our organization's legacy alive and flourishing for years to come." On Tuesday, October 23, 2018 founding members of the 1885 Society gathered to celebrate a momentous day in The Salvation Army of Jackson County's history. During a special reception & plaque dedication, members of the society celebrated The Salvation Army's history while committing to its future. "We are honored to have our founding members commit to The Salvation Army's legacy and future. We hope that they're pledge support will spur others on to come alongside and do likewise. We couldn't be more proud than we are right now" says Skarritt. Membership is open and The Salvation Army is looking for new members to join. For more information about The 1885 Society please contact Shannon Skarritt, the Development Director at 517-782-7185 x111 or shannon_skarritt@usc.salvationarmy.org.